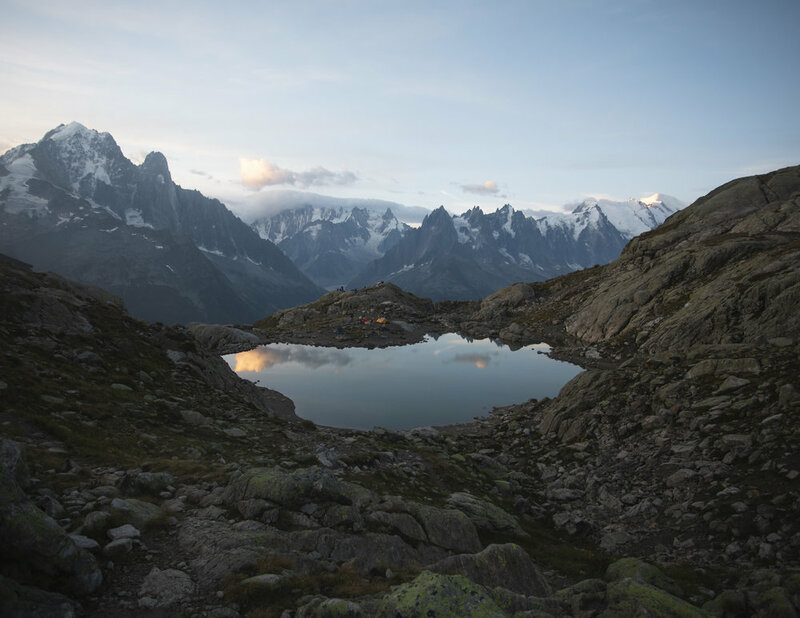 Looking out towards the glacier d’Argentiere as the sunrises. How can I do this? & What gear do you bring into the mountains? I’ve decided to create this journal in order to tell the tales from my own adventures and inspire you guys to go plan your own! I’m hoping to publish more journals in the upcoming future which might talk about a specific trip I’m working on, or my favourite gear and I might even touch on the subject of the environment and our beautiful National Parks and how much we need to work to protect them. So why do I love spending nights in the Alpine? Whether I’m sleeping in a mountain hut, tent or bivvying it’s a sensation that never gets old. It’s the simple idea of feeling small amongst the jagged, giant peaks that surround you. Often, you’ll be protected from the elements by a flysheet just millimetres thick and if your in for some bad weather things can turn grim and little gnarly but still it’s this sensation of being in the midst of it all that keeps drawing me back to the places I love. Whether that’s an alpine bivi or cold water surfing in winter. For all the amazing nights under the stars in the alpine I’ve had I’ve also had plenty of cold, wet and long nights. Don’t always expect to have perfect conditions, after all it’s the mountains and forecasts can change quickly. Bivi spot below the Aigulles Rouge in the Chamonix Valley. Ahead one can see the Mont Blanc, Aiguille de Midi, Grand Jorasses and Mer de Glace. Rab Ascent 900 sleeping bag used here. So what minimal gear do you require? Both to enjoy your bivi but also be safe. 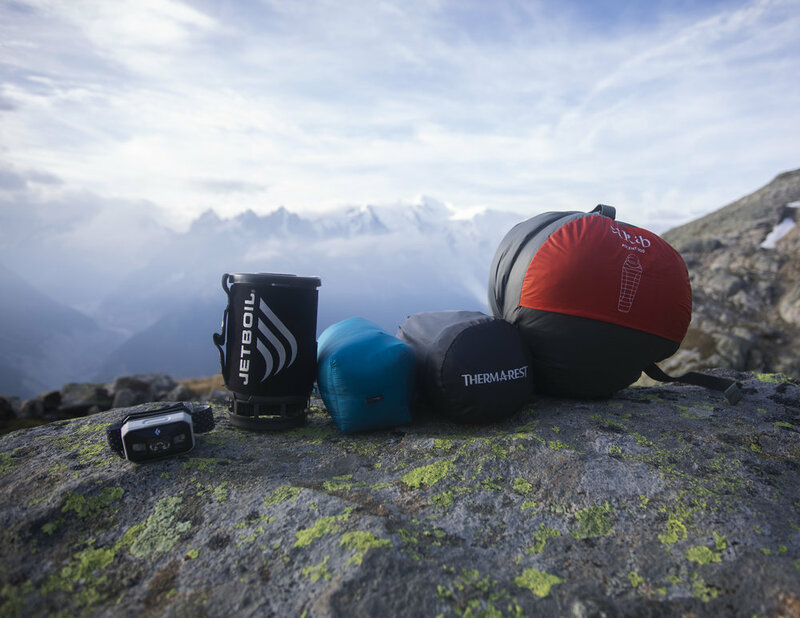 Gear can be a tough topic as the newest, lightest kit is often tempting but if you spent that £150 on shiny new gear do you have the money for a trip to the mountains? I’m guilty of it too, but I’ve also spent plenty of years using basic gear before upgrading to the newer bits of kit. I’m going to run you through my existing set up but also what I started out using and hopefully there will be something for everyone out there. I want remind you that having all the gear will never replace mountain knowledge. Every year people under estimate the mountains, especially in Europe as the fact that they can see the road down at the valley bottom often gives a false sense of safety when in fact weather can change dramatically and you need to have experience in dealing with a range of situations. I was lucky and as a child as my parents were mountain lovers so we spent most of our summer holidays camping and hiking which meant i’ve been surrounded by the mountains and spent countless hours in ranging conditions from hot sunny days, long rain storms and complete white outs. At the same time I in no way consider myself as a expert and pretty much every time I head into the mountains I learn new mountain knowledge. What i’m trying to say is learn the skills you need to be safe out there! Gear can’t replace that knowledge. So what do I take on a basic overnight trip? Obviously each trip will vary with the gear you need. For instance a winter trip will require more than a summer one and if you intend to sleep somewhere one a technical climb you may even be sleeping in a harness whilst being anchored to a piece of climbing protection. For the purpose of this Journal i’m just going to go through the basic kit for a overnight hiking trip. Some of my basic gear with the Mont Blanc behind. From left to right. Black Diamond Storm headlamp, Jetboil, Arc’teryx Cerium LT Down jacket, Thermarest NeoAir Xtherm, Rab Ascent 900 sleeping bag. This piece of gear has genuinely revolutionised my nights in the mountains. For years I only bought the £15 - £20 foam matts (which I still love as they are indestructible and so reliable) but lack in comfort and winter performance. My NeoAir packs down super small but keeps me warm even on super cold nights as well as keeping my back happy for the next day of hiking or climbing. I still use a foam Thermarest Z Lite Sol for trips that I’m not sure where i’ll be sleeping. On rocky ridge-lines for instance i’ll take the Z lite over the NeoAir as sleeping spot may be smaller so it’s a more modular sleeping mat and also more durable against rock scrapes. I’d suggest starting off with a basic foam mattress and if you intend to spend more nights in the mountains then you can invest. My Ascent 900 bag has kept me warm more nights that I dare to count, I use it from the first chilly nights in autumn through to the last cold nights in Spring. This bag has genuinely been a do it all for me from temps down to -16 in the campervan in Europe to bivi spots up in the mountains i’ve used it thoroughly. The only downside is that it’s slightly bulkier than the more modern lightweight versions as it’s a slightly cheaper model however for the warmth ratio it gives it’s a solid piece of gear. I also have a hand me down Rab sleeping bag that is around 30 + years old which was given to me from my dad which he used back in the day and this has become my summer bag as it’s far more compact than my big winter sleeping bag which makes it ideal for summer hiking. I swear by a natural down fill sleeping bag as the level of comfort you’ll get and warmth to pack size ratio is worth every penny, but look after a natural fill sleeping bag as they require a little more maintenance. A stove system will vary from trip to trip and the number of accessories I might pack. For example on a basic alpine trip you just need a stove that packs small and can make a basic meal. Meanwhile, if you were on a climbing expedition to Pakistan you would be better off with a multifuel stove for base camp and using your alpine stove that runs off gas for only the climb. Multifuel stoves will burn a range of fuels such as; diesel, kerosene, aviation fuel etc so are ideal when you don’t know what fuel you may find in a foreign country. Jetboil Stove - This stove is pretty handy if your not cooking gourmet meals as it’s a integrated system where the burner, gas and feet all fit into the Jetboil pot. The pot has a insulating sleeve which makes it great for eating straight out of and warming your hands. The jetboil also boils water incredibly quickly so there’s little waiting around but it means cooking you have to watch your food 24/7 or it’ll stick to the pan. Trust me on this, i’ve messed up many times! For a cheaper stove solution the MSR Pocket rocket is an amazing product. I think it’s around £30 and they perform really well, you just have to buy a pot separately and built up your system. MSR pocket rocket pictured in Image below left. Areopress, Porlex Mini Coffee Grinder & Coffee Beans - This only comes on non technical trips where weight and pack space isn’t critical, but on a basic trip there’s nothing better than a solid cup of coffee in the morning. Trust me this little set up will make you friends in the mountain if you offer to make others a coffee. I’m not going into to much detail on this as i’m actually writing a specific Journal on this. Sea to Summit X mug - I bought this in New Zealand when I lost my old enamel mug, I didn’t know whether i’d enjoy using it cause it’s plastic but it does have the benefit of folding completely flat and it’s big enough you could eat out of it as a bowl to as a result it’s been on 90% of my trips since. Lighter - Even with stoves that have a ignition system you must carry a lighter. If the ignition breaks, you need a way to make food on a trip. On a single night trip you could live though the night hungry but on a expedition this could be a disaster. Titanium Spork - Yes, I prefer a real knife and fork but for overnight missions it’s simple, unbreakable and takes no space in my pack it’s perfect. It usually lives in the sleeve holder on the Jetboil. Couscous - My absolute favourite food in the mountains as it’s pack size is far smaller than pasta for example and it’s tasty and gives you good energy for the next day. I usually through in some dried figs or salami and when I back it up before I start the trip I add some spice so it’s actually got flavour. Dried fruits & Nuts - For adding into meals when cooking or for energy release when covering ground. Just try to avoid salted nuts as this will make you drink water quicker meaning you have to refill more often. Clif Bar - A super tasty treat and full of the energy and protein you need when doing a technical route in the mountains. My favourite flavours as white chocolate and macadamia or blueberry crisp. Clif Bar please sponsor my new campervan with a care package? Water depends on the route i’m doing as there might be a water source I can easily and safely fill up from. If your relying on this try and get some idea of where you might find water from either looking at your map or asking locals. If there’s a refuge where you sleeping you can most likely fill up there. If you are worried about drinking the water either boil it or add a neutralisation tablet. If your camping in winter and above the snow line you can simply melt that into water using a stove. As a basic rule i’ll carry my 2.5lt hydration bladder and a 1lt Nalgene, so i’ve got a total of 3.5lt of water in 2 different sources in case the bladder leaks the Nalgene will never let me down. Head torch - I’m currently using a Black Diamond Storm which features a 350 lumen max brightness which is great for spotting belays in the dark or searching over distant ground for a safer route or camp spot. Usually I just set it in a mid range brightness as that’s perfectly adequate for simple hiking. Mine has an emergency strobe mode which is a handy feature, thankfully never had to use it so far. There are cheaper Black Diamond head torches between £20-30 that offer less features but will work for someone just starting off. I personally think that even if you get a less bright one it has to be a reliable brand. If your up in the middle of the mountains with a knockoff version it might break and will either just make a night a little less pleasant or in worst case scenario could lead to a accident. Portable power pack & charger cables - If your using your phone as the device that you might call Mountain Rescue on in case of a emergency this is key as it’ll keep your phone charged. For me I also power my Canon 5D IV batteries off a USB so it means I can guarantee i’ll be able to shoot the images I want, even on a multi day trip without carrying a load of batteries. 1:25000 Map - Detailed map showing technical terrain is a must when heading into the mountains. A compass is very key in winter or when weather conditions are less than ideal. I’ll be honest in summer if it’s a easy route I don’t carry one as you can normally orient yourself using natural features such as where the sun is in the sky and the trail will be pretty easy to find. However, in more remote regions, technical routes and winter it’s vital. First Aid Kit - Again it varies with the trip, if your heading to a remote region this needs to me far more extensive more along the expedition style med kits. My expedition med kit includes a back up head torch as well as that for me is a small item that could save your life if a situation turns bad. If it’s for a single overnight trip, a basic range of bandages, plasters and painkillers are usually all I take. Emergency Whistle - Often preferred as it’s louder and more apparent in the mountains that there is something wrong, mine lives in my First Aid kit 24/7. Mountain Refuge, Tent or Bivi? Cooking under headlamp light during an impressive blue hour in the Chamonix valley. The choice between staying in a refuge, tent or bivi depends on what’s available, most technical alpine climbing routes will require a bivi or single wall tent as you may be sleeping on ridge lines or small ledges. However, in the Alps there is a culture of refuges but these tend to be on the less vertical climbs or at the base of these. A tent will be more comfortable than a bivi and you’ll be better protected if the weather isn’t favourable so if it’s your first time spending a night in the mountains i’d suggest take a lightweight tent. As you get more comfortable with sleeping in the alpine why not try out a bivi bag which is effectively just the exterior fly sheet of your tent that is made into a sleeping bag shape and goes around your sleeping bag and sleeping mat. 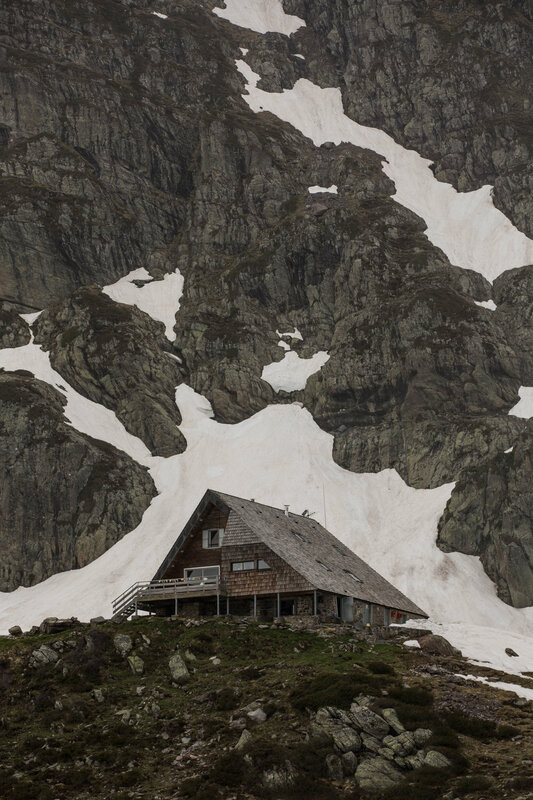 Refuge Ayous in the French Pyrenees during Spring. Access required crossing numerous snow fields due to big snow fall during the previous winter. Mountain refuges hold some of my favourite memories however there are some tricks to get the best out of them. Avoid them in the height summer! In popular locations around Europe these will be full to the brim, which yes can be nice as you can share mountain stories but can also often cost a lot in the touristy areas, as much as 20 - 30 Euros a night. I’d always rather carry a tent or bivi up to avoid that cost. In the low season you can find yourself with less people and then get more time to chat with the local that runs the refuge. I personally love this as you can get really useful knowledge of the area or route you are going for. In winter most refuges close and are unserviced but some will have a area that is open to use and free in winter. You have to bring everything you need like a usual bivi just you get a roof over your head which can be appreciated if your spending multiple nights up there or if there is heavy snowfall. To get info on these ask locals or check on the refuge’s website or local mountain guide’s and/or tourism office. Choosing a spot to bivi? When choosing a bivi spot you want to think about; protection from the wind, if it rains will the water collect where you are sleeping, environmental hazards such as rockfall, avalanche in winter etc. There are some great places to sleep just do some prior research on the map and choose a safe spot. In popular camping spots you might see areas others have pitched a tent such as a stone circle (pictured right). These can be great spots as they have wind protection but still check the area first as the previous people who camped there might have not seen a rockfall danger for example. If your near a lake or water source in summer think about Mosquitos and the noise may keep you awake. Anywhere with a bit more of a breeze will reduce the number of insects flying around. If it’s your first ever experience sleeping in the mountains choose a place that doesn’t have a treacherous walk in or out as if you need to retreat due to a storm rolling in you want to be comfortable with the descent under torchlight. Make sure you’ve checked the forecast when spending time in the mountains there are lots of small techniques to eliminate risks that take next to no time but will dramatically increase your enjoyment of the moment. Bivi spot below the Aiguilles Rouges in the Chamonix Valley protected by the wind by a small rock wall. I’m hoping this Journal might have helped inspire some of you to get outdoors and try your first overnight bivi! Thank you so much and i’ll leave you with the image below to spark your plans for your next mountain mission! Shortly after sunrise above the Lac Blanc, Chamonix. Autumn 2018.